The GTR is known for being a technological wonder of an automobile that is a bit on the heavy side in terms of curb weight. One of the best ways to get rid of some of this unnecessary weight is the installation of a lightweight battery in place of the factory version which weighs in at over 27lbs. 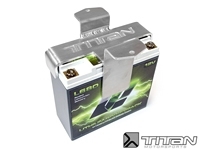 The Titan Motorsports GTR Battery kit was developed as a complete lightweight battery solution for the GTR which includes a Braille Battery, and lightweight engineered mounting bracket. The included bracket is CAD designed and laser cut from 6061 Aluminum to allow the battery to be installed in the factory location. No permanent modifications to the vehicle are required allowing for an easy installation that is completely reversible in the event the car is returned to stock. while weighing in over 20lbs lighter than the factory battery. The Braille Battery and Bracket weighs combined at only 7 lbs 4 oz. The performance vs. cost of this battery makes it a great value in a lightweight racing battery for road course, asphalt circle track, and dirt track with alternators. This 12V Lithium-Ion battery has 25 minutes of reserve and a total capacity of 13Ah. It can deliver 800A max and 125A continuously which is more than enough to start engines up to 500 cu in. and supplement the alternator’s output. This battery features fast cell balancing for safety, long life, and maximum capacity.